We’ve heard from many members of the community that the City process can be confusing, and we agree! In response we’ve put together some tips & tricks for effectively participating in the public process. Please note that this is not a comprehensive guide to all City processes. Boards and Commission meetings are also open to the public. For a list of these groups, visit the City Clerk's page. 72-hours prior to a regular public meeting, the agenda and any applicable staff reports are made available to the public. All public meetings are subject to the Brown Act. For more information visit the League of California Cities website. City Council, Planning Commission, and Design Review Board meetings are televised on Channel 27 and also available to watch online. The City Manager provides information about upcoming topics on the City Council agenda via email. To receive this bimonthly update, sign up online. You can sign-up to receive email notifications when agendas get posted online as well as other City updates. Smile – you’re on camera! All meetings are filmed and aired on Channel 27 as well as on our website. City Council meetings are formal, although we do try to lighten the mood occasionally with a joke or two. The City Council sits at the dais with staff below, including the elected City Clerk and City Attorney. Members of the public are invited to sit in the audience. “Open Time” is a time where members of the public may speak on items that are not otherwise on the agenda. Speakers are asked to limit their remarks to 2 minutes. The “Consent Calendar” is a list of regular orders of business that requires just one motion and vote to approve them all. This typically includes things like contracts, street closures, purchasing agreements, and other routine items. Members of the City Council or public may pull items off the Consent Calendar if they wish to discuss them in more detail before a vote. A “Public Hearing” is a formality for certain proposed actions designed to allow the public to provide “testimony” on the issue. Their remarks are recorded for the public record. Sometimes public hearings are required by law, and other times the City Council may use them to gather information that will help them make decisions. A “Special Presentation” is normally used when the City Council wishes to formally recognize a group or individual for their contribution in some way. An “Other Agenda Items” are discussion items for the City Council. Many types of items can fall into this category, far too many to list. These items either require the City Council’s approval or can be informational reports on programs and projects. The “City Manager’s Report” and “Councilmember Reports” are standing items in which the City Manager and members of the City Council can report out or provide brief updates from their work on other regional bodies and organizations. Staff makes a presentation that explains the topic and requested action by the City Council. Depending on the nature of the topic, other groups may make presentations as well such as project applicants or consultants. The City Council may ask questions of staff about the topic at-hand. Following questions from the City Council, the Mayor will ask for public comment. Members of the public are invited to speak up at the podium for 2-minutes. Please start by stating your name for the record. After public comment time concludes, the City Council may ask staff to answer any questions asked during public comment. It is at the discretion of the Mayor and/or City Council to decide whether the Council or Staff will respond to questions posed by the public. The City Council then deliberates and votes on the item. Study Sessions – these are special meetings scheduled for the City Council to hear detailed information on a topic. The Council can ask questions and provide initial feedback to staff on a topic. The City Council does not make decisions at these meetings. Study Sessions are subject to the Brown Act and agendas are posted 72-hours prior. Although staff usually makes a presentation, they don’t normally write staff reports. Community Meetings, Workshops, and Town Halls – the City will often host forums on large projects or important topics in order to solicit input from the public throughout the course of a project or provide information on an issue that impacts our community. Help us create and maintain a respectful and inclusive environment. Please do not applaud or “boo” other speakers. This can make some members of the public feel too intimidated to speak and public speaking is scary enough! Please don’t make personal attacks, and be civil and courteous. If you are speaking at the podium, please address the City Council, or other Board or Commission, rather than staff or the audience. Remember, your time allotment for speaking is 2 minutes – it can be helpful to practice your comments ahead of time. You are welcome to bring copies of printed materials for the City Council to consider. Please provide them to the City Clerk. Sometimes meetings can run late! Although food and beverages are not allowed in the Council Chambers, you may want to put some trail mix in your pocket to snack on in the lobby. The City Council meets the first and third Mondays every month at 7 p.m. in the City Hall Council Chambers. In addition to their regular meetings, they occasionally hold special study sessions on certain topics. If Monday is a holiday, the meeting is held on the following Tuesday. Check out our City Council page to learn more about our City Council! We have four City Councilmembers and one elected Mayor, elected at-large for four-year terms. Current members include Mayor Gary Phillips, Vice Mayor John Gamblin, and Councilmembers Maribeth Bushey, Kate Colin, and Andrew Cuyugan McCullough. There are a couple ways to contact your City Council. You can email all of them at once, by using an online Contact Form that sends the message to all members of the City Council, including the Mayor, or you can email or call them individually. If your email contains any questions, they will forward it to the appropriate staff for follow-up. If the nature of your email is to register your opposition or support on a topic, they will note your comments and consider them as they weigh the issue. You may not receive an additional response from either the Staff or the City Council. Where do I find information about the topics I’m interested in? Our website is a great resource. Most major projects and programs have webpages dedicated to them, with background information and links to related documents. If you have trouble finding the topic from the homepage or individual department pages, try the search function on the top of the screen. Still can’t find what you’re looking for? Call us at (415) 485-3070 and we will either help you navigate the website or connect you to the appropriate staff. How do I place an item on the agenda for City Council discussion? The City Council agenda is generally set by the City Manager in consultation with the Mayor. Certain agenda items are required by law, and others are selected based on the City Council’s established goals. Members of the City Council can request items to be placed on future agendas upon consensus of at least three. As a member of the public, you can contact members of the City Council and ask them to make the request, however unless a consensus of three members is met the item may not be put on the agenda. I have a brand new idea or topic that I want to share with the City Council. How do I let the City Council know? You have a few options in this scenario. The easiest place to start is to email the City Council your idea or request. If they are interested, they will ask staff to look into the issue. You can also send a letter or call us at (415) 485-3074. 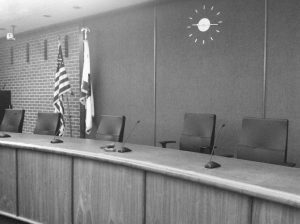 You may also attend a City Council meeting (first & third Mondays at 7 p.m. at City Hall) and present your idea during “Open Time.” Fill out a speaker card, available at the entrance to the City Council Chambers and give it to the City Clerk. “Open Time” occurs at the beginning of the meeting and provides members of the public an opportunity to talk about a topic that is not otherwise found on the meeting agenda. You are afforded two minutes to present your idea or issue to the City Council. The Brown Act does not allow the City Council to discuss an item not on the agenda, but if they are interested in the topic they can ask staff to follow up with you afterward. I don’t have time to attend a meeting. How do I voice my opinion? Be sure that the City Clerk receives your letter prior to 4 p.m. the day of the meeting, however the later the letter is received the less likely the City Council will have an opportunity to read and consider the contents. How do I ensure that my comments are part of the “public record”? The best way to ensure your comments are part of the “public record” is to provide a copy of them to the City Clerk. Aside from that, all comments made at public meetings are recorded and included as part of the public record. Depending on the nature of the project, staff compiles comments received and sometimes includes them as part of the staff report. If you have any questions about this, please contact the City Clerk’s Office or the staff assigned to the project. Emailing your comments only to an individual member of the City Council may not ensure that the City Clerk or staff receives a copy.